The University of Strathclyde has been put under pressure to annul Oscar Pistorius’ honorary degree after he was sentenced for the murder of his girlfriend Reeva Steenkamp on Valentine’s Day 2013. The 400m runner had always admitted to being responsible for the death at his home in Pretoria, South Africa, but claimed he believed his partner was an intruder leading him to fire four bullets through the toilet door, killing the law graduate-turned-model. The honour was presented to the infamous Paralympian in November 2012 after making history as the first double leg amputee to compete in both the Paralympic and Olympic games – just months before he had shot dead girlfriend Reeva Steenkamp. This was in recognition for his great success in sport after his participation in the London 2012 Olympics and was given to him during a ceremony at the university’s Barony Hall. 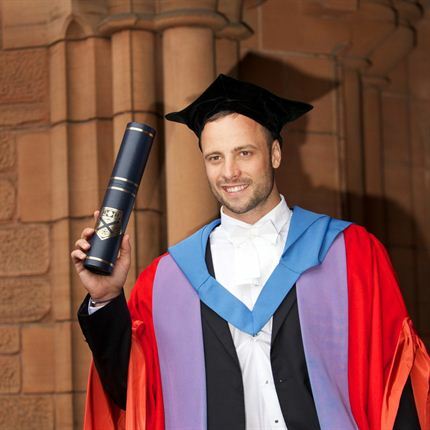 When he received the degree Pistorius made sure to praise the University for its research into the development of prosthetic limbs. After Pistorius, dubbed the ‘Blade Runner’, was handed his five year sentence for manslaughter – which he is believed to only spend 10 months of in jail – women’s groups have urged the university bosses to act. The group believe he is no longer an appropriate role model for the students of the university.